Conference on Artificial Intelligence (IJCAI), a prestigious biannual event that brings together a mix of computer scientists, psychologists, mathematicians, neuro-scientists and philosophers. The discussions were varied. Can we make a universal IQ test that covers everything from people to programs to pot-plants? What can tool-using crows teach us about our own intelligence? Several robots were presented, with varying capabilities. A company called MavHome talked about the houses of the future: "The home has certain goals, such as minimizing the cost of maintenance and maximizing the comfort of its inhabitants. In order to meet these goals, the house must be able to reason and adapt." In such a house, you wouldn't need to switch equipment on or off - it would do that automatically. Computer intelligence is also being developed for more serious applications, such as analysing blood tests for disease. A lot of people are interested in applying computer intelligence to the study of genetics and molecular biology - a rapidly growing field called bio-informatics. The study of Artificial Intelligence (AI) began 60 years ago with the invention of computers. This prompted computer-pioneer Alan Turing to ask the question "Could machines be as intelligent as humans?" So far the answer is partly yes but mostly no. Computers are very good at problems such as playing chess. They have great difficulty though with the things we take for granted: handling day-to-day life. Machines find everyday life challenging partly because of its unpredictability, and partly because they lack the rich understanding of the world that we have by nature. Strangely, beating Kasparov at chess is easier for a machine than holding a conversation about last night's telly. For a long time, AI seemed to be just a science fiction fantasy. Periodically, there would be a burst of excitement over a new technology. This would be followed by disappointment, as the new technology failed to deliver. In many ways AI is still a pipe dream, yet the mood of the conference was optimistic. Many problems that were previously thought unsolvable are now being cracked. Problems that would previously have required years of computation can now be solved in under a second. This progress is partly driven by the astonishing - and ongoing - improvements in computing power. Alongside this, there have also been remarkable improvements in the algorithms (mathematical techniques) used for computing problems. 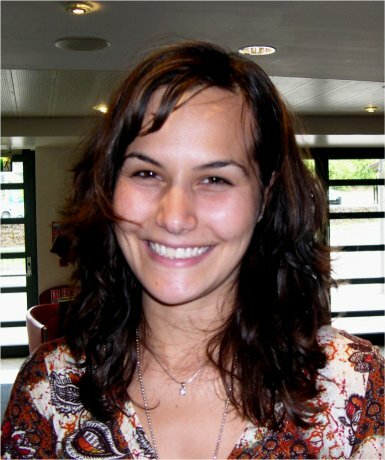 One highlight of the week was Zeynep Kiziltan's work on faster algorithms for problem solving, which earned her an award for the best Ph.D. in the field. Zeynep, a bright young scientist from Turkey, is excited about the state of AI. "We're making a lot of progress!" she said, but added that the future would bring further improvements. "In 10 years time we will look back and think today's systems are very primitive." Stars of the IJCAI conference: the robot QRIO and the human Zeynep Kiziltan. The conference also honoured the work of British scientist Professor Geoff Hinton, who received an award for Research Excellence. Hinton was a key figure in the development of neural networks - computer programs that imitate collections of nerve cells. Our brains - and those of all animals down to the humblest slugs and snails - are made up of nerve cells. These are connected together so that when one is active, it can trigger others to become active or switch them off. Over time, the connections between cells change, allowing animals to learn. Remarkably, these networks of nerve cells can produce the wonderfully complex and varied behaviour we see in the natural world and above all in ourselves. Faced with the failure of conventional computing to tackle everyday problems, AI researchers looked to the brain for inspiration. They developed techniques based on networks of simulated neurons. In conventional computing, programs are carefully written by IT experts. By contrast, a neural network is not programmed but trained. It is shown lots of examples. Clever algorithms - devised by Hinton and his colleagues - allow it to learn from these examples by altering the network's connections. Neural network programs are good at spotting visual patterns, and they are used to perform tasks such as handwriting recognition (converting human handwriting into computer text) and checking for forged signatures. They are far simpler than real nervous systems though. A typical neural network has a few thousand neurons. By contrast, an ant's brain has 250,000 nerve cells. A human brain has over 10 billion - including dozens of different types of neuron, specialised for different tasks. Trying to get computers to imitate the human brain has led to the growth of a new field known as cognitive science, where computers are used to gain insights into human behaviour. Experiments with people can be compared against the behaviour of computer models, allowing theoretical ideas about the mind to be tested. This is where computer science meets psychology. Cognitive scientist Daniel Wolpert described an interesting new statistical model describing how our perception is filtered by what we expect. Known events are largely ignored, whilst unexpected things grab our attention. One consequence of his model is that in quarrels, we consistently underestimate our own force (which we know about and expect). This can easily cause arguments to escalate, with both parties convinced that it is the other person who is to blame for shouting louder, or shoving harder. Wolpert demonstrated this with an experiment where volunteers exchanged taps, trying - and failing - to match each other's force. Interestingly, when the experiment was repeated with schizophrenic patients, they performed better than normal - avoiding the escalation of force. According to Wolpert, this is because schizophrenic patients are somewhat disassociated from their actions, and can thus be more objective. Cognitive science advances hand-in-hand with AI. Wolpert's work uses computer science to answer questions in psychology. But it can then influence future robot design - which will in turn enable more experiments. 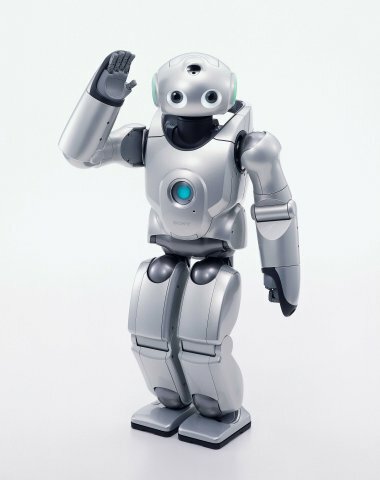 The current state of the art in robot design was demonstrated by Sony's QRIO robot. QRIO looks like a small astronaut, with large cute eyes. He chirps and dances very endearingly. Crucially, he can walk better than previous robots - which he demonstrated by navigating a (very very simple) obstacle course. True walking remains beyond the reach of current robots though. With two dozen motors QRIO is a complex machine - but that's nothing compared to the human body, which has over 600 muscles. QRIO experiences the world through two camera eyes, microphone ears, an infra-red range finder and 7 touch sensors. A human also has 2 eyes and 2 ears, but millions of touch, taste and smell sensors. QRIO can manage less than 1 mile-per-hour over smooth ground. Humans can do 10 miles an hour over rough terrain. The biggest difference of all is in thinking: Through our flexible understanding of the world and our ability to think creatively, we can solve the complex many-faceted problems of daily life. Our brains enable us to scale mountains, read newspapers, raise families, compose music, build cities, and send men to the moon. QRIO is able to recognise faces and say "Hello". Inspite of the impressive progress reported this week, human beings remain the only real source of intelligence.